Success in anything does not come easy. Success requires a lot of commitment, consistency and rugged focus. How well you are able to apply these 3 things in your life depends on the size of your goals, how big your REASON WHY is, and the size of your inner strength. When you start each day, there is a small amount of willpower that you have to get things done. But this energy quickly fades off over the next 6 hours of waking up if you don’t quickly take advantage of it. Unfortunately, most people waste this important part of their day on useless things and by doing so, they waste that willpower and basically don’t achieve anything for that day. The next day, they automatically do the same thing unconsciously and very soon, their life is in complete mess. But successful people do the opposite. They invest the first 1-3 hours of their waking time, when there energy is high to REFUEL their mind and their body so that this helps to prepare them for the day. And they do this by having when Eben Pagan calls the morning ritual. This has nothing to do with calabash and palm oil. A morning ritual is actually a series of intentionally created tasks that you undertake each morning to fuel your mind and body and that also helps you to maintain focus. And you may change your morning rituals from time to time based on what your goals are at the time. The basics of all morning ritual are focused on the fact that you need a great mind and great body to be able to achieve your goals in life. So, what you do each morning is to fuel your mind and strengthen your body so that they are well equipped to help you meet your targets. This instantly sets you apart from the millions of people who wake up each day and go around with a feeble mind, a weak spirit and a broken body. There is no way you are going to achieve any success like that. As you can see, his morning ritual is intentionally designed to remind him of his focus, drive up his energy, and pump up his spirit. Mine is a little different from that. And yours doesn’t have to be the same with mine or his because we are all different and we all have different goals and schedules. 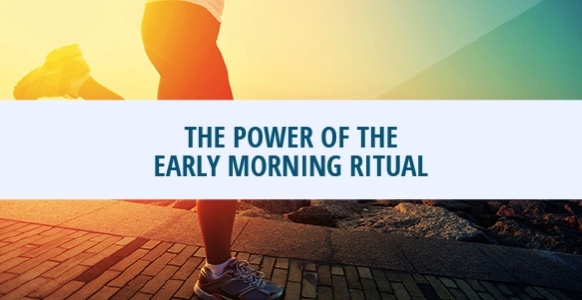 So, how do you create a morning ritual that will help you? Before we talk about that, it is important that you define what your target are. Aka What are your goals? What do you intend to achieve? You also ought to realize that following through with your morning ritual requires that you have some level of self discipline on its own. For instance, if you are the type of person who wakes up each morning to drink alcohol and put on the TV, you will need some level of self discipline to change to something like drinking water and reading an inspiring book instead. And to be frank, self discipline isn’t as easy as it sounds. But then, there are hacks that you can use to tempt your body into doing what you want it to do. In the next part, I am going to share with you a self discipline hack that I discovered and applied in my life to get myself moving on with my morning rituals. Drop questions and comments below. Nice read, well done Toyin, God bless. Great thought. This thoughts are true and will be greatly helpful. Thanks Mr Toyin. Eben Pagan, as the name suggests is a pagan and that’s why he talks about rituals. I want to follow with you and get initiated into having my own intentional rituals too. Waiting for the next post. This is a great piece to read especially on the 1st working day of the week. Thanks for sharing your thoughts. Thanks Toyin for sharing this. It is a basic truth that how well one starts the day goes a long way in determining how well you will finish the day’s activities. Most people have an idea of how well they wish their lives should be but honestly self discipline is a major key to getting to our destination. Whatever our beliefs are, one cannot succeed without keeping in constant touch with your Creator. With determination, we would be successful. This is a very great insight Toyin. Thank you so much. Highly educational and informative. Thanks alot. I like the morning ritual idea but self discipline is the keyword here. Without it nothing works. Thanks very much for this wonderful wake up call!! Thanks for the inspiration drawn from your write up. God bless u richly Sir, a timely information, it is well appreciated. Thanks bro, this is an eye opener, will be looking forward to your next post. thank you for this motivating season i am very grateful. This post has really motivated me and reminds me of many things I have abandoned simply because I forgot the REASON WHY I embarked on them in the first place. As a matter of fact, it has also motivated me to work harder on my goals. Looking forward to the part two. Great Write Up. Keep It Up. Looking Forward To The Next Part. Its a wakeup call to living a life of excellence. Thanks Mr Toyin God bless you. Thank u for d lesson. I blv this is timely. There’s a lot of points , vital points I picked from this write-up on morning ritual and its a believe in oneself ( resolve to follow a routine ) that doing something of such nature will ultimately yield a good result. Please send us d hack part cos that’s where my main lesson is , Sir ! Thanks bro Toyin .You remain the other side of my weakness .God bless you remain. THIS IS COMMENDABLE. IM READY TO ACHIEVE MORE BY PUTTING THIS INTO SERIOUS PRACTICE. THANKS. Truly this is an expert advice for all both online users and those not even interested in online programs. Thank you Sir. i appreciate your information. Good piece! Keep doing a great work! Inspiring. I have begun to think positive and more alive unlike before. Thanks a bunch. Great. Keep it up Toyin. Nice one. Things one knows but abandoned them most times. Thanks for the reminder. Inspiring.But he didnt mention appreciating ones maker each morning as part of the rituals which i think is also import. This is a great one, but like bamidele said,I guess the first thing is recognising one’s maker (GOD) first for the gift of life & a new day. What a great morning ritual. But why at times one gets deviated as the day progresses. Wow this is powerful I just read this now, thanks a lot.